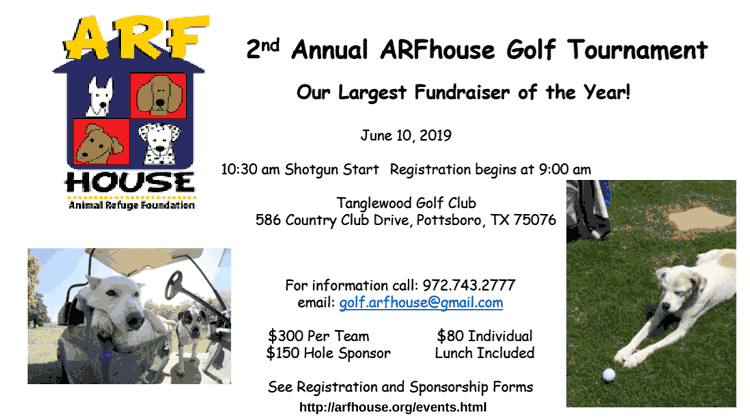 Friends of ARFhouse, we are happy to announce that we will hold our 2nd annual golf tournament at Tanglewood Golf Club. Last year was a huge success for us. It was our single biggest fundraiser ever and it was great fun for all participants. If anything made us happier than that, it was the money we raised for the dogs of ARFhouse. You know that everything we do, we do for the dogs. They are the beneficiaries of all of your support, and we could not do what we do without you. Thank you! Please consider supporting this tournament. There are many ways to support it and multiple levels of sponsorship. All of the information is posted on our website and on our Facebook page. There are sponsorship levels from $5000 to $150 and everything in between. Of course, there is golf. The format is a 4 person scramble with handicaps (calculated per team), and our entry fees are $80 per individual or $300 for a team registration. Entry fee includes breakfast and lunch plus beverages for the day. We will have a putting contest with potential cash to be won, and we will award 1st, 2nd and 3rd place prizes for the top 3 teams. In addition, there is a prize for longest drive and closest to the pin for both men and women participants. If you would like to support us by donating items for silent auction or raffle, please email golf.arfhouse@gmail.com. You may drop off items for auction or raffle at the Liz O’Brien Adoption Center or arrange for us to pick up your items. Some items such as gift cards can be easily mailed. Please see our website or Facebook page for a registration form or sponsor form. Any questions you have will be answered if you email the golf.arfhouse@gmail.com address. Come out and join us for a day of golf for a great cause on June 10 at Tanglewood.